If you intend to spend a few hours at the Harvard Film Archive's Agnès Varda retrospective (it starts Sunday and is well worth 80 minutes, an evening, or an entire weekend of your life), you'll leave aware of how little of Varda's filmmaking takes place beneath the cover of darkness. She practices her craft in broad daylight. During the 1950s and 1960's French New Wave, of which she was a little-known part, that was a matter of necessity. It was easier to shoot in the day. But into the 1970s, '80s, and beyond, the presence of light in Varda's moviemaking has come to mean an absence of secrecy. This is a director we can trust. The archive's series rounds up features, shorts, and documentaries, which range from great to unsuccessful (Varda has yet to make a bad film). Varda, in fact, with her amazing magenta pageboy, never stops. She'll be in town for several of the films, and her exquisite new memoir, "The Beaches of Agnès," which is part of the series, was just named the year's best French documentary. There is a place in her best movies where the commonplace and the exalted meet - rather, where the commonplace achieves exaltation. This is especially true in her documentary "The Gleaners and I." In 2000, when she was 72 years old, Varda traveled around France conversing with people who find sustenance in the discards of others. The cumulative achievement of so many picked-up potatoes, oysters, grapes, and objects of refuse was a kind of religion - the church of Finders Keepers. Varda never says, "Voici! This is holiness." She doesn't have to. The backhanded sanctity you might get from certain filmmakers - a bourgeois condescension that says, "I have lifted this rock and discovered the human condition" - never arrives in "The Gleaners & I." In her way, Varda lives under the rock, too. Even in 1954, when her life as a film artist began, Varda was gleaning; she picks up people. "La Pointe Courte" (1954) is set in a Mediterranean fishing village, and the actual residents (big-boned women, barrel-chested men) embody the movie's earthly concerns. What's so wonderful is that Varda never seems like an outsider interpreting foreign lives. Her technique is essentially neorealist. I could watch sheets flap on a clothesline and piles of wood do nothing all day. The spell is broken only when an actual outsider drops into town and sparks all kinds of philosophizing about the meaning of love. 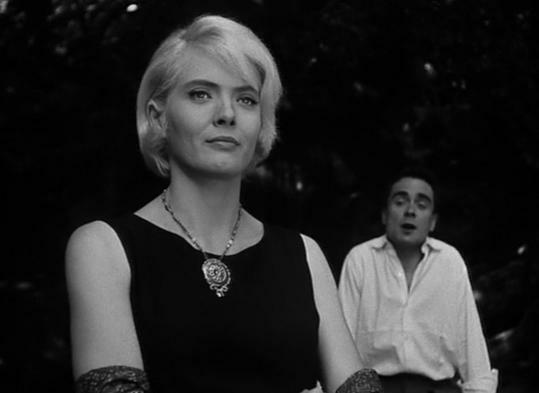 "Cléo from 5 to 7" was released in 1962 near the height of the New Wave and is fondly regarded as part of the movement. Essentially a day in the life of a successful singer nicknamed Cléo (Corrine Marchard) who thinks she is dying of cancer, the film is full of play - jump cuts, musical interludes, roving handheld camerawork - but it feels studied, like work. Varda had just married Jacques Demy, whose left-of- New Wave musicals "The Umbrellas of Cherbourg" and "The Young Girls of Rochefort" were on their way. And in "Cléo," you can feel in all the formal dissonance a pleasant experiment. Varda was close to the New Wave, yet she never got wet. The best moments in "Cléo" are the quiet ones - a montage of faces looking at the camera, an actual silent movie that shows up in the last third. They say everything. So does the silence at the end of "Le Bonheur" ("Happiness") from 1965. It was Varda's first completely color feature. It was heavy on the Mozart, heavier on the idea that bliss is ignorance. The movie is about a married man who decides to take a mistress. Its blasé attitude toward infidelity was something of a shock at the time, but that attitude is nothing more than an attitude. Man and wife are working-class folks, but class concerns are neutralized by the Eden-like paradise the film makes of a Paris suburb. Varda, nonetheless, is up to something from the first shot, which cuts between a healthy single sunflower and wilting family of them. What still feels right about the film is how modern it is. Add a third woman and cut back on the artistic sensibility, and this could be a series on HBO. That modernity is what makes Varda so exciting as a filmmaker. Even when her engagement with her times doesn't entirely succeed - the ambitious feminist drama, "One Sings, the Other Doesn't" (1977) does not; the surreal older woman-loves-little boy romance, "A Little Love" a.k.a. "Kung Fu Master," (1987) does - that engagement never flags. Varda never went in for costume dramas or empty nostalgia pieces. Were she to make one, you sense that she might come back with Sofia Coppola's "Marie Antoinette," a movie that can't help but see the past through the prism of today. In 1985, Varda's evolution culminated with "Vagabond," the best movie I've seen about the pros and cons of being alive. It opens with a girl frozen in a ditch in a rural town then backs up to explain how she ended up there. The girl calls herself Mona, and Varda cast a teenage Sandrine Bonnaire in the part. Mona is a street-smart drifter, a gleaner of sorts, too - clever, horny, scrappy, uncouth, vividly unwashed. Bonnaire gives us all that, and the humor and contradictions in between - a punk-rock naïf. On screen, the folks who meet Mona testify how the experience affected them. Women - an intellectual environmental activist; a dowdy young maid; a decrepit spinster - find themselves especially touched by what they see in her: a passionate soul, a free spirit. Even in her dirty, coarse state, Mona is the woman she wants to be, no longer chained to society's grind, without portfolio but not lost, either. Of course, Varda is asking what freedom means anymore. What, consequently, does feminism? The film anticipates everything from "Thelma & Louise" to "Wendy and Lucy." It's the movie that "The Piano" director Jane Campion seems to have devoted her career, in vain, to top - and Campion has had a great career. But only Mike Leigh's grimmer "Naked," from 1993, comes as close to Varda's forlorn bulletin on the human condition. Mona stands in for ideas of liberty and incivility, but Varda never loses sight of Mona as a person. She's always somebody's daughter, friend, former co-worker - a symbol maybe, a cipher never. That is essentially what separates Agnès Varda from the intellectuals and stylists who have come up with and around her. She's a people person. And, naturally, no matter how many movies we see in the dark, Varda knows how much truer people are in the light.